I didn’t know if I was allowed to take photos, so this particular shot was taken ninja-style with my iPhone at lightening speed – hence the blurriness. From left to right: David Drabik, James Waugh, Ed Gentry [hidden behind the podium], and Evan Skolnick. I’m known for being a very happy, bubbly personally naturally. Yesterday, however, I’m quite certain I had a smile on my face for every second of the day. It was, quite honestly, one of the best days of my adult life – especially on a professional level. 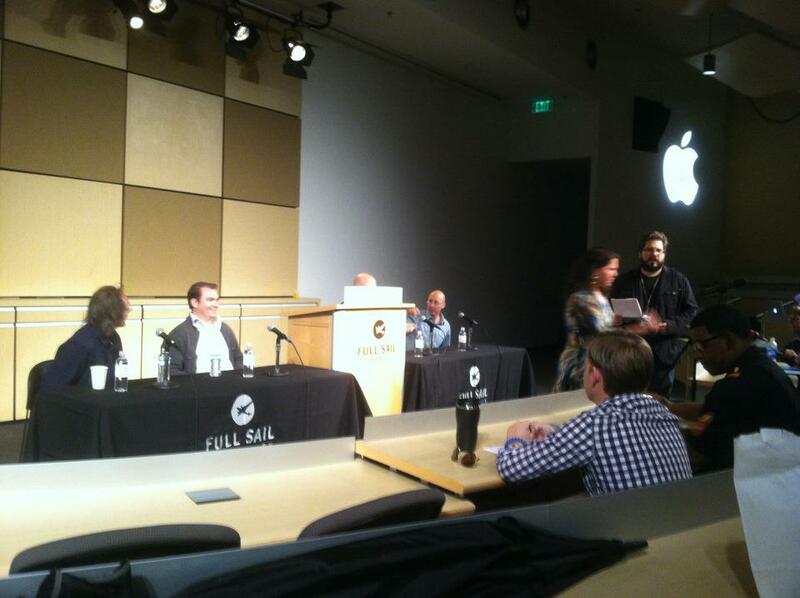 I had the unique opportunity to attend the Entertainment Writers Panel at Full Sail University before work. It was an open Q&A session, moderated by one of my favorite professors, Mr. Chris Ramsey. I could dedicate hours just to describing his incredible class and his impact on my writing, but that’s a blog post on it’s own! On the panel were some pretty BIG names in Entertainment writing/storytelling: David Drabik [writer for The Tonight Show with Jay Leno], James Waugh [Senior Story Developer for Blizzard Entertainment], Ed Gentry [Game Designer for WisdomTools], and Evan Skolnick, [Lead Narrative Designer for LucasArts.] I sat in the second row, practically shaking with excitement as the panel filed in and took their seats. Being the über nerd that I am, I pulled my laptop out so that I could take notes. The next 90 minutes were a blur of information, wisdom, and insight. Fortunately, I took a LOT of notes, so I didn’t miss a beat. I practically transcribed the session! While this event in itself was enough to make the top twenty on my list of amazing professional experiences, what happened at the END of the panel is what puts it in my top five. Who am I kidding? My top two. The first being enrolling at Full Sail University. I was approached after the panel by one of the writers for the school’s e-newspaper/blog and asked if I was interested in writing a summary of the event. I’m guessing she saw me zealously typing away [she was a few rows behind me] and was impressed – or frightened – by my ridiculous excitement for the event. Either way, she made the offer and I basically SHOUTED my acceptance. Might have scared her a little, but that’s ok – I was excited. Holy opportunity! I didn’t know students were allowed to write for the school blog. Woohoo! If that wasn’t already enough of a high for me, a few moments later James Waugh – the Senior Story Developer for Blizzard – stepped away from the panel and walked towards the audience. Feeling brave and riding the high from the prospect of writing for the school blog, I approached him to thank him for the session and introduce myself. To my shock and delight, he stayed and chatted with me! Of course, I basically lost all cognitive ability and use of the English language – as is expected when you stand in front of your idol – yet he seemed genuinely interested in the gibberish I had to say. We exchanged business cards [head exploded right about here, in case you’re wondering] and he encouraged me to email him and maintain an open dialogue regarding my work and my interest to get into story development for gaming. After he left, I had to take a few moments to regain professional composure and refrain from skipping around the auditorium. After all, that’s not the behavior befitting a serious professional writer, now is it? Needless to say, I headed into work with a smile that would rival the Cheshire Cat. Through great personal restraint, I managed to make myself wait a full three hours [torturous] before emailing him, in the hopes of not looking too excited, desperate, or otherwise crazy. And now… the waiting game! Pun absolutely intended, by the way. So what’s the moral of this ridiculously long story? Being nerdy pays off. So type your notes, my friends, and ask the questions that pop in your head, regardless of the audience around you. Take the opportunities to learn, grow, and develop – you never know who may be impressed with your tenacity! Sounds amazing! Wish I could have attended. I can send you the rough draft of my write-up on it if you’d like to hear more about it!